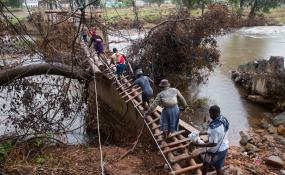 Residents cross a makeshift bridge in Copa where 63 houses disappeared under mud and rocks brought downstream by Cyclone Idai’s torrential rain. A further 38 houses were damaged. Residents estimate about 200 people were washed into Mozambique. Only one of the bodies recovered has been identified. Blessing Matambo came to work on Mzvuzvu Bangedzai's six hectare plot of land outside Biriri three weeks ago, after crops were destroyed by flooding and equipment washed away. Bangedzai said 70% of the maize crop, which was ready to harvest, was destroyed. Avocado, lemon and banana trees were also swept away, along with his irrigation system and piping. Edna Kabayangiri lost her two-year-old girl in the mudslide that hit Ngangu. Kabayangiri said she was washed about 100m from her house and was stuck for hours in the dark calling for help. Her child's body is yet to be found. Alexander Muyambo walks past his destroyed family home in Copa. Muyambo's father, who was a school headmaster and supported his extended family, was lost to the floodwaters after the tree he climbed was uprooted. Muyambo was in Mutare studying for an electrical engineering diploma when the cyclone hit his home village. After hearing the news, he walked 50km from Chimanimani to find out what had happened to his family.